All artwork supplied to We Print It for checking must be supplied as a pdf file. Any artwork not supplied as a pdf will be considered a basic redraw and incur an artwork fee. There are several different ways to send us artwork. We prefer uploading through our website when placing your order but if you’d like to supply separately there are several different options. All conventional offset printing is done using 4 inks to make up colour images & text. It is very important that all files are supplied to WPI as CMYK or a colour conversion will be performed that may not convert as you would expect/like. Photographs from cameras are generally in RGB format as RGB is a better form of conveying images composed of light i.e. on computers or tv screens. This does not convert to print so all RGB images will be converted to CMYK. It is imperative that this conversion is done prior to sending to WPI as this is the only way you can have an idea how the files will look once they go to print. A third type of colour format is PMS or Pantone Matching System. Rather than being a collection of 3 or 4 colours like CMYK and RGB, pantone colours are specific shades with their own codes which create consistent colouring every time. We currently only offer PMS colours on envelopes and carbonless books. We suggest using 100% black for all text and lines on your artwork. This means that the CMYK values should be set to 0 for cyan, magenta and yellow, and 100 for black. 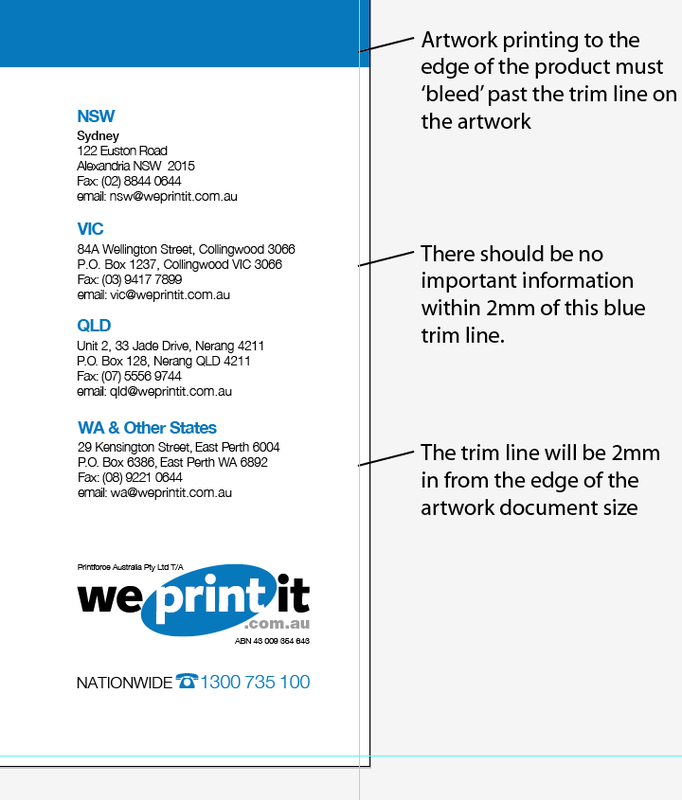 Please make sure all lines and text are also set to overprint. If your CMYK artwork contains large areas of the colour black, we strongly recommend the addition of at least 40% (C) Cyan in addition to the 100% (K) Black to produce a richer, better looking black. When printing right to the edge of a product you must include 2mm bleed on each edge. For booklets 4mm bleed is required on all pages. Bleed is ‘extra’ artwork that will be chopped off the edge of the flyer but allows margins for guillotines to trim into allowing no chance of white edges showing. Make sure there is NO important information or image area in the bleed area is this WILL be trimmed off. Do not put any important information or text within 2mm of the product edge (i.e. 4mm from the artwork edge) as trimming can move 2mm either way of the trim area and your text could be trimmed off. Make sure that you check that your images display how you would like them to at 100% when creating the artwork. The minimum line thickness for all artwork is 0.3pt while text should be at least 8pt. All fonts must be embedded before your files are made into a pdf. Make sure you check your pdf before sending to WPI and make sure that it looks as it should. Alternatively converting your text to curves will avoid any font issues.